Sierra Nevada Journeys is currently seeking capable volunteers to help develop the youth of Sacramento into the problem solvers, engineers, scientists, and critical thinkers of future generations. Specifically, we are seeking individuals interested in facilitating evening Family Science Nights. These educational events bring students and their families together at their school for an evening of hands-on science exploration and design challenges. 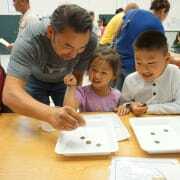 Family Science Night events are held at local elementary schools in the Sacramento area. Volunteering with Sierra Nevada Journeys is an opportunity to work with an industry-recognized organization and build your skills in: research-based methods of outdoor science education, inquiry-based instruction, and facilitating hands-on science experiences. Family Science Nights take place on Tuesday and Wednesday evenings during the school year. Volunteer time commitment would be from 4:30 PM - 7:15 PM. Means of transportation to local Sacramento Schools.